TIP: This article explains how to add a new team member via the admin panel. If you already have a user in WordPress that you want to convert into a Projectopia Team Member, please see Converting an Existing User. To add a Team Member in Projectopia, first go to the Teams area by hovering over Teams in the admin menu and clicking Team Members. Then click New Team Member. You’ll now be presented with a series of fields to complete. These fields are all required as they are used in various parts of the plugin. 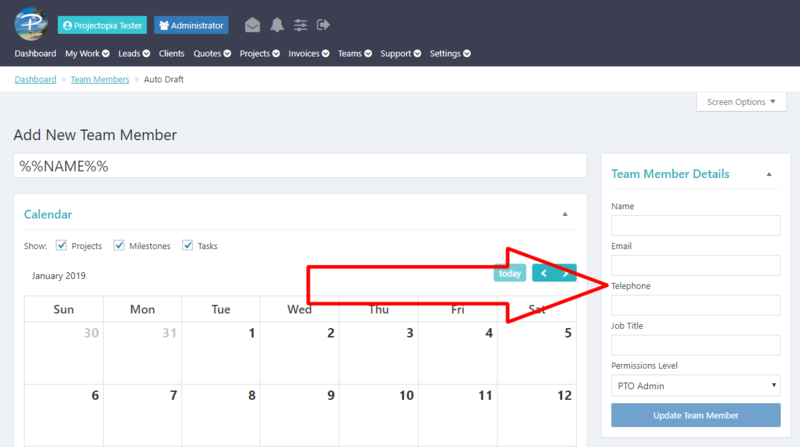 Fill in all fields as illustrated below and click Update Team Member. TIP: Be careful when assigning a role that you do not give the user too many permissions. PTO User is a built in role that only gives the user basic permissions that allow them to work on projects and tasks that are assigned to them. To find out more about Roles & Permissions, please see Roles & Permissions. A Team Member will be created in Projectopia. A new WP User account will be created in WordPress and given the role selected when creating the team member. The user created in step 2 will be linked with the team member created in step 1. That’s it, this team member can now log in and manage projects that you’ve assigned to them.